Unusual Kentucky: The Center of Yum! 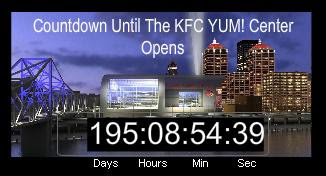 There's been much speculation about what the new Louisville downtown arena would be named, and now the wondering is over: Louisville-based Yum! Brands has become the naming sponsor for the building, which is now called - wait for it - the KFC Yum! Center. I haven't heard PETA's reaction to this turn of events yet, but something tells me there'll be no joy at vegan central tonight. I did notice some waggish Cards fan on a message board note, "When PETA throws red paint on us as we enter the KFC Yum! Center it won't matter because we'll already be wearing red!" A-hyuk.